The Netherlands is suffering from a problem many countries dream of – they don’t have enough prisoners to fill up their prisons. Since 2005 The Netherlands has experienced a drop of 43% in incarcerations. The reasons for this are varied, including a heavy emphasis on prisoner rehabilitation, better drug screening at Schipol Airport and use of technologies like electronic tagging. The government has been forced to close 19 prisons and has been looking for alternative uses for these empty facilities. As ever, the Dutch response has been innovative. Some prisons have been rented out to foreign governments, like Norway and Belgium. 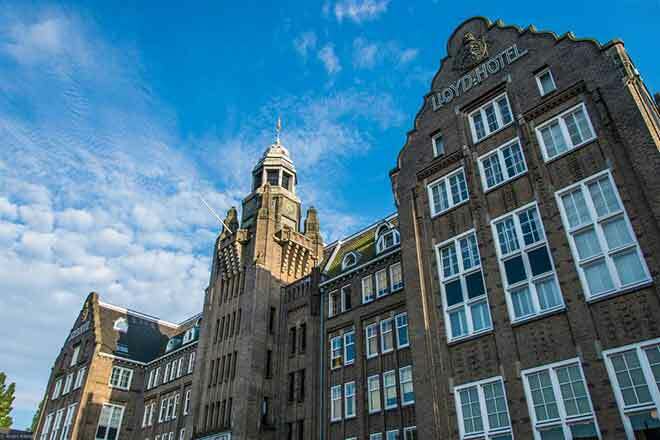 One in South Amsterdam has been turned into a boutique hotel. But the most unusual use for prisons is linked to the recent migration crisis. The Netherlands has received a significant number of refugees since the beginning of the crisis, at least 58,000 people in 2016 alone. Before the crisis the Netherlands had 40 asylum reception centres. Now there are 121, but it’s still not enough to house everyone. Processing times for asylum application have also increased dramatically – from an average of 6 months before the crisis, to a current estimate of 7-15 months. This means more refugees are spending longer in asylum support centres, unable to work or move forwards with their lives. So, the Dutch government has come up with an innovative solution – housing refugees in former prisons. What are the prisons like? So far 13 prisons have become asylum centers. Not only is this an efficient use of government resources, it also allows former prison guards to avoid redundancy and retain their jobs, working to support and guide the refugees. Most of the prisons are relatively comfortable places, with the cells allowing private living spaces for families. Prisons often feature outdoor gardens, kitchens, washing and sports facilities, including a full indoor football field in one. The prisons have been altered somewhat, with authorities removing high walls and barbed wire and converting cell doors to open from the inside. 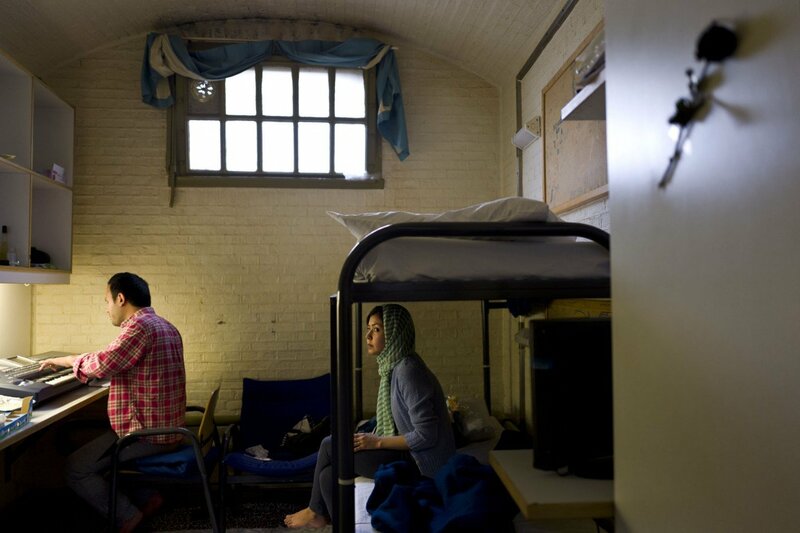 For many refugees, this environment is more comfortable than the alternatives – a tent city or living on the streets – but authorities have taken extra care to ensure that any refugees who are former political prisons are only housed in cells if they wish to be. Jan Anholts of the Central Agency for the Reception of Asylum Seekers insists, “We want people to feel safe and secure”. However, the situation is not perfect. Originally intended as a temporary emergency measure, some critics claim that the government is dragging its feet on a longer-term solution. Although housing refugees in prisons provides some short-term relief, problems in the asylum system are deeply rooted. There is a general housing shortage in The Netherlands and problems of bureaucracy are ongoing. At a prison in Vluchthaven a group of 130 refugees from Africa have formed a protest group, We Are Here (WZH) to remind the public and the government that although they have temporary housing, their situation is yet to be resolved. Refugees cannot work and many struggle with issues such as poor quality legal advice or threats of resettlement. Outside Vluchthaven’s former prison is an informal squatting site, known as the Vluchtgarage, where refugees refused places in the centre are forced to live. Despite these criticisms, many refugees are happy here. Living in the prisons allows them private space and a degree of control over their lives. 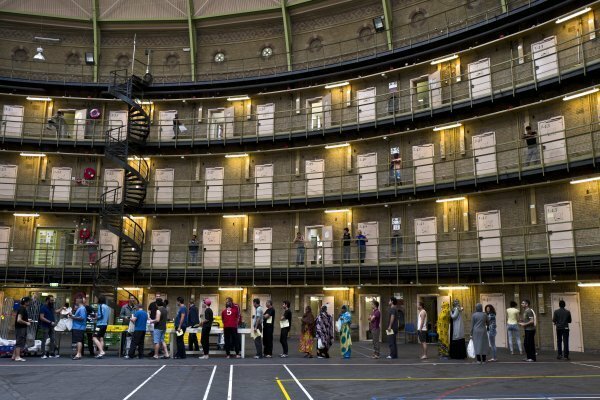 Of course, residents can leave the prisons at any time of day or night and support groups regularly visit to help residents adapt to Dutch life and the Dutch language. Outdoor spaces are used to teach refugees the eponymous Dutch art of riding a bicycle. The prison provides stability for refugees, something they have long sought, and allows them the time and space to focus on their asylum applications, gathering evidence and taking advantage of having a fixed address for legal issues. How long former prisons will be used to house refugees is uncertain. But what is certain is this solution is currently the best possible use for empty prisons. A Syrian man speaking to Muhammed Muheisen, Associated Press Chief Photographer, sums up hope for the future in the community – “If a country has no prisoners to put in jail, it means this is the safest country that I want to be living in”.